The I-PAC and Joystick arrived this week, so I was able to start testing the correct way to get everything working the way I wanted. I’ve hooked up the joystick to IPAC and started working on it. 2D control (UPDOWN and LEFTRIGHT translations) have been tested. 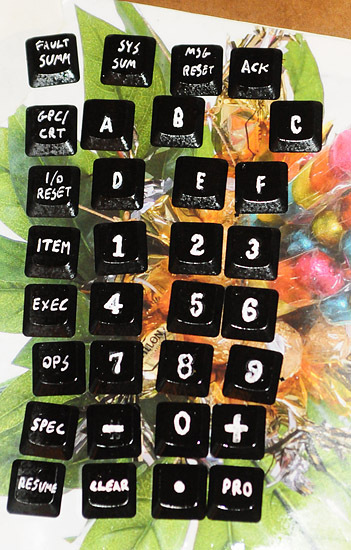 I’ve also tested the keypad. Unfortunately the IPAC has some limitations I was not aware of. It only supports one keystroke per PB. when a PB (PushButton) assigned to a macro is presses the macro is issued only ONCE. After consulting with Andy from ultimarc (creator of the IPAC) We have come to a conclusion that the correct way of doing multiple key strokes will be to program a Macro that will be triggered along with a keystroke . that means that each PB will be connected to both a unique keystroke and a “common macro”. this generates another problem, because all the PBs will share a common ground and the “common macro” once one of the PBs will be pressed they will ALL trigger. Again, Andy has given me all the answers I needed, and the circuitry would include 1N4148 diodes connected on each of the “common macro” “legs” to prevent this from happening. I have also made a test drilling of the Keypad panel, This was done in order to evaluate the accuracy of my “blueprint” and to make sure I know what are the correct drill sizes I need. The I-Pac VE controller chosen for the Project – supports 28 switches, the THC itseft will use only 6 of them. So I will try and add a keypad and hopefuly it will be functional later on down the road – on current SSM version (2.4) it will not be functional. I’m pretty sure I will use the Apem 1415N switches – they pretty much what I need (and only a tad smaller then the real thing). but that might change during the build (havn’t ordered them yet). I will try and use an IDE connector – but I am currently unable to find a decent IDE socket. I’ll need to start scavange Mobos to see if I can dissmental two. if this will not wok, I will use an IDE cable (without the connectors) – this will allow me to hook up all 33 planed switches (from the keypad side) for future possiable upgrade. 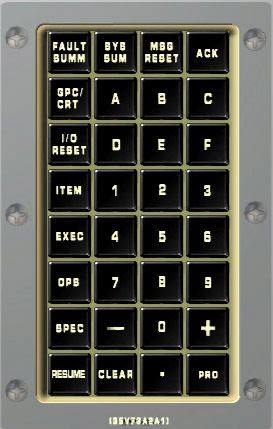 shuttle Keypad is 8*4 – which makes it 32 switches . In addidtion I plan of using the controller “Shift” functions to allow me to use a simple off-on toggle switch and use the same keypad as two of the shuttle keypads (future upgrade will also allow On-Off-On switch to simulate 3 keypads by running two seperate shift modes). A short count shows that the current controller only allows 22 more switches to be connected (6 are THC). luckly for us SSM only uses 21 of the keypad’s 32 keys. 0-9,period (. ), + and -,OPS, ITEM, EXEC, SPEC, PRO, CLEAR, RESUME and GPC/CRT. one is of course the toggle switch.